to play Pickle Ball, indoor Racquetball, and your own workout weight room. Waterfalls can put you to sleep at night and so can the crickets, or give daytime ambiance to read a good book. 3 tiered water falls carries 6,000 gallons with a 24 ft pool below 4 ft deep. Can be stocked with fish or used for swimming. Photo taken before house was painted and before landscaping around tennis court. Yes, we have been swimming in the pool. The floating clouds in some of the pictures show up nearly every morning in the valley below, because of an active river a mile away that is fed by Mt. Hood. Tennis court has broad beam lights for fun evening tennis parties. Upper & lower deck view of cloud drift. Distance to foothills leading up to Mt. Hood - about 40 miles. 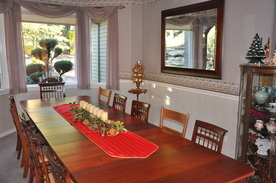 Dining room Christmas time for 12. Will handle 16 at Harvest Table. Ceiling 10 ft high. Ceiling stereo speakers every room upstairs. Can be turned on or off in each room. Mt. 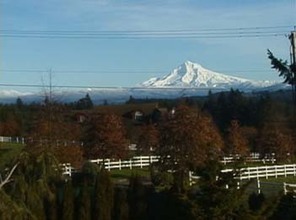 Hood view from upper deck Fall of 2007. 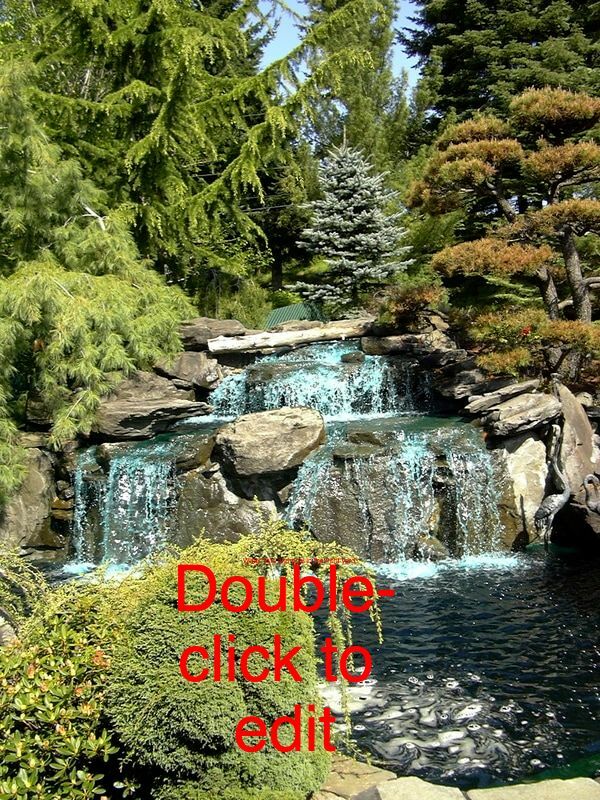 Click on large picture under the small ones to scroll through all photos, then click "Play" or use "arrows". Lower pool is 24 ft long & 4 feet deep. The waterfalls can be turned on & off with a clock timer from within the garage. We have nice frog sounds that put us to sleep at night. Main Front Gate opens and shuts from inside house via phone. 2nd gate by large rock to the far right is also operated from inside the house. The intercom to enter is outside the gate, which rings to every phone in the house. Nine yard trees are sculptured every 2 years under care of Japanese arborist. When both gates are open this is a circular driveway. Tennis parking area and side driveway leading to Pole Barn. 15 cars can be parked inside privacy fence. Pole barn can handle large RV's. This house was finished in 1997-98. It was built for and by the builder as a show case for his business (Elite Homes - Oregon). He put several high-end features into this house, lived in it for a few years and sold it to the current owner. During that time he got into tennis and built a $95K tennis court with night time lighting, sugar coated fence, speakers for music, accent lights along sidewalks to the court and a rock wall as part of the north court fence. OWNER: Jim Hastings, USPTA Tennis Professional, national coach, speaker and author to the tennis industry. Connected with some of the world's #1 touring pros, including pros who have played exhibition matches at this house. See short bio on Home Page of this website. 1) Those who are active and like to have fun. It was designed as a party house inside and out. surround sound TV on both upper and lower levels. 3) People who want privacy. 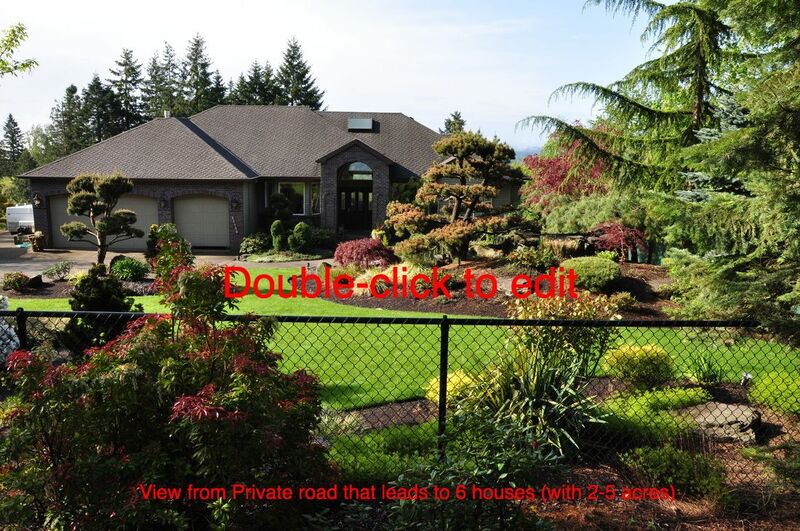 6 ft high privacy fence surrounds 1.1 acres and front automatic iron gate is controlled by intercom to home phone. alert your cell phone of any movement, 24/7 alarm system to notify fire, medical and police. 5) Video / audio phone system at front door entrance so you can see the person you are talking to and they can talk back to you. around us have 3 to 5 acres. Our street borders "Landscape Farm Territory" that sells flowers, shrubs and decorative plants world wide. 6) Those who want to be surrounded by nature through large windows and beautiful landscaping. 7) People who want to be 2 hrs from the Pacific Ocean, 1 hour from Mt. Hood (great skiing), 3 hours from the desert resorts of Oregon and 1/2 hour from some of the best cuisine and restaurants this side of New Orleans. SIZE OF HOUSE: Sq/ft approx. 4,300 + not including 3 car garage. There is expansion room for a 15 x 30 ft addition if desired. High ceilings (9-11 ft) on main floor. Lower floor ceiling is also 9 ft.
LOWER LEVEL: totally finished with large rec room (50 x 17), library room - man cave, two bedrooms, separate furnace from upstairs, laundry, bathroom, storage shelter. 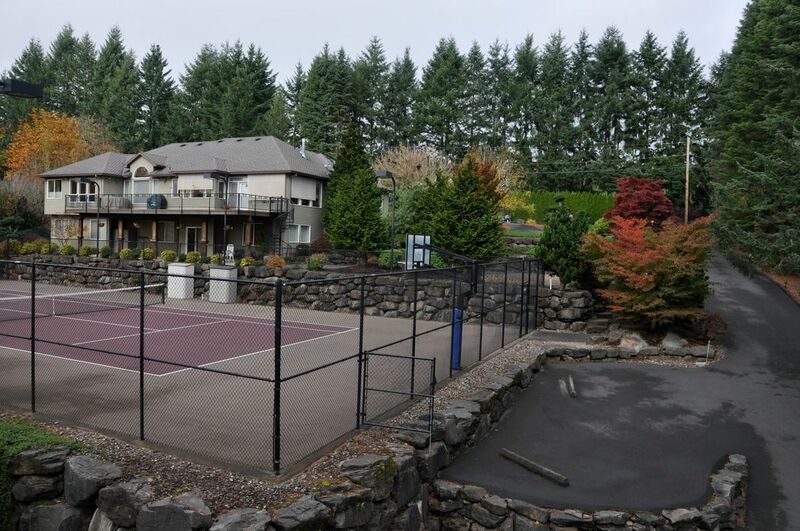 The lower level is plumbed for separate living in case owner wants to make it into a private living quarters with its' own exit door to the lower level deck that overlooks the tennis court and Estacada Valley. 50 year high grade roof. 85% of exterior is cedar siding with brick facing in front of house. Over 47 accent landscape lights (hard wired) around entire property for evening parties or guests. Full Court lighting for evening parties or night time tennis. 15 car capacity parking inside gated and fenced 1.1 acres. Circular driveway with gated entrance and separate gated exit. Both gates are motorized and controlled from inside house. 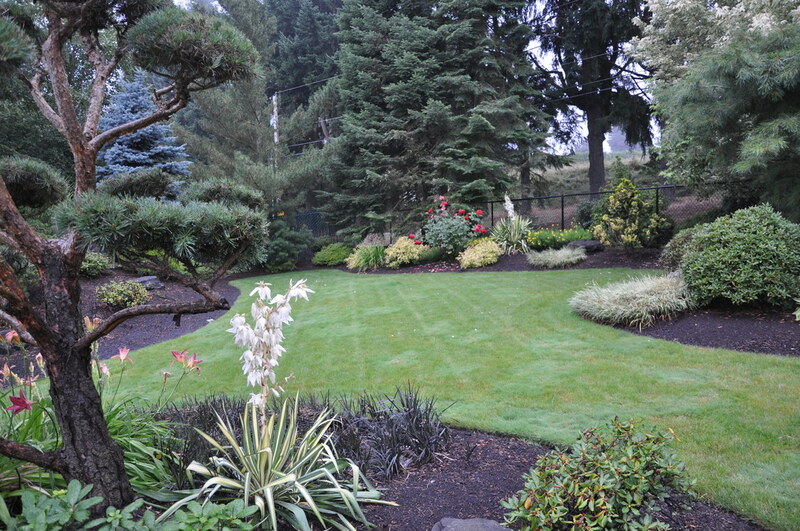 Appraised landscape & rock work valued over $230,000. House has built-in hidden area for a safe if you have valuables. Master bedroom with inside jacuzzi. 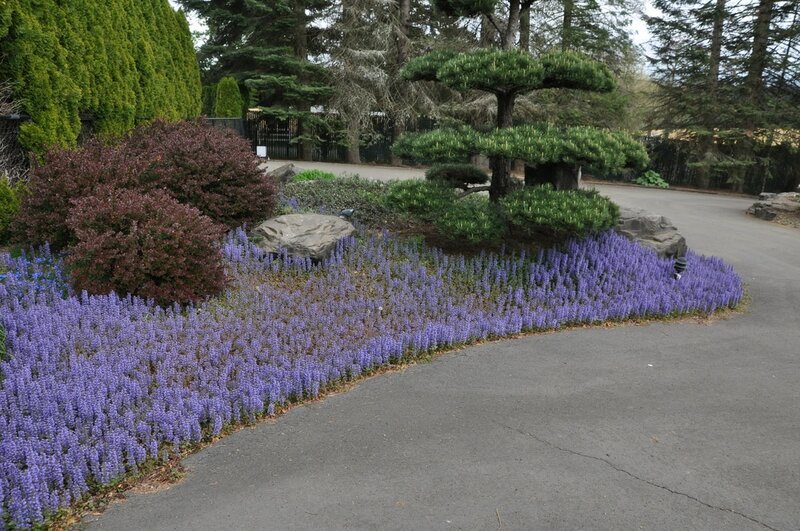 High end landscaping with timed release plants and shrubs for constant color. Entire 1.1 acres on automatic sprinkler system. Pole barn walls are dry walled to commercial grade thickness. Large pole barn (43 x 54 ft) with full bathroom facilities including hot water shower. Barn floor is 6" thick concrete for commercial grade vehicles such as large RV's. Large upper cedar deck (17 x 50 ft) surrounded with iron fence railing. Lawn behind tennis court can be used for a soccer field. Heavy duty iron spiral stairway from lower to upper deck. House is pre-wired for a generator in case public electricity goes out.